Ambition. I have it and you have it. It provides the motivation and determination necessary to learn new skills and reach our goals in life. Some seek to be the best for the fame and the glory, honour and praise. Others to do it for power and superiority. Some just do it to inspire people. And then there are those who simply want to please themselves and their family. I'm sure you're all wondering why on earth I am talking about ambition. Well its for one reason, and one reason only. As knitters we are always striving to knit the perfect gift for friends or family, something they'll love and cherish forever. We also aim to learn every stitch and technique under the sun - even if it takes us a lifetime. Sometimes though we can be overambitious, such as taking on that ridiculous Shrug with ruffles from hell. And although during the process we may drive our other half's crazy and drive our family up the wall as we show them what we are knitting for the umpteenth time, they know we are just showing of our recent achievements to gain approval in some way. And when those magical words "I love it" are heard, we know we have hit a home run (and if you are anything like me, you proceed to knit 3 or 4 more), and our desire for perfection is complete. 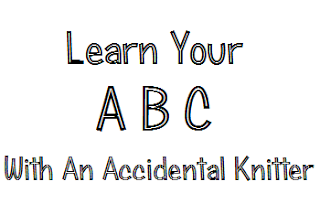 So, that kicks of 'Learn Your ABC'. If you'd like to check out the posts of other bloggers who are taking part, simply click on the names in the Mr.Linky. Or, if you have written a post, simply type your name into the box, and paste the link to your 'A is for...' post. Natalie is a little late to the party, but check out her post nonetheless! Right there with you on that one! Thank goodness for husbands and families who put up with and understand our drive and ambition! I'm going to give this a try. Hopefully I will be able to come up with an A topic by the end of the day. So true. It's always so satisfying to give someone a gift they love and being able to say "I made that." I know all about that! I love being able to give handmade gifts, but my partner get so cross when I show him my knitting for the umpteenth time, and I'm sure he can see no difference in it. He's always very complimentary though! I have one of those shrugs with ruffles from hell in my queue! Sorry I'm a little late wih my post. I'll do better in the following weeks. I like your post. I crochet a lot better than I knit but I really want to impove my knitting skills. Thanks again for organizing this.